Really looking forward to heading to Austin, Texas for the next few days for another speaking engagement with the Texas Hospital Association! Here is an excerpt from their website discussing the goals and objectives of the program I will be taking part in. This activity is jointly provided by AXIS Medical Education and The Texas Hospital Association. 1. Identify actionable methods that can be used to provide care to patients. 2. Review barriers to quality improvement. 3. Clarify common reporting complexities. 4. Define adequate measurement outcomes. 5. Describe the effects of patient aggression of both patient and staff safety. 6. Demonstrate how to use data to identify health disparities. 7. Identify features of a high reliability organization. 8. Discuss four guiding principles of Patient and Family Centered Care and their use in quality improvement. 9. Identify solutions to prevent medical errors. 10. Discuss best practices that are proven to minimize the “human error” component of medicine. 11. Identify three frequently reported preventable adverse events in Texas. 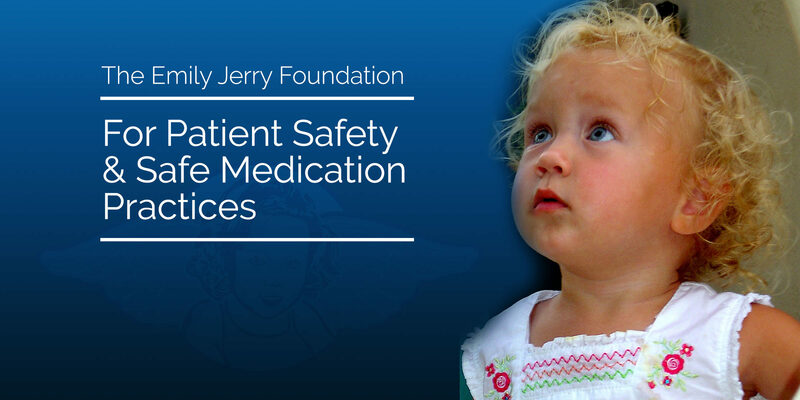 The Emily Jerry Foundation was honored to be represented by Christopher Jerry as part of the Pediatric Adverse Drug Event Panel discussion at the Patient Safety Movement Foundation (PSMF) on Feb. 4th during the 2017 Global Summit in California. The preparation for this important event began at the beginning of December with the drafting of a comprehensive white paper, Actionable Patient Safety Solution (APPS). Click here to download the resulting Executive Summary Checklist associated with APPS. Dr. Nathaniel M. Sims, friend and ally of EJF, headed up and organized this very important endeavor. Dr. Sims and Chris met in June 2013, when Chris gave a keynote session at the annual Association for the Advancement of Medical Instrumentation (AAMI) 2013 Conference and Expo entitled “Changing the Culture of Medicine-A Father’s Powerful Message”. Dr. Sims asked Chris if he would be interested in participating in the Medication Errors Panel discussion at PSMF in 2014. The following is a short video that the PSMF produced, where Chris describes Emily’s story. The video was used to start the conversation. Additionally, you can also view the video of the entire Medication Errors Panel Discussion from 2014. Three years later, flash forward to the Pediatric Adverse Drug Event Panel discussion this year, where the focus was put on saving the lives of the smallest and most vulnerable patients… babies and children. Due to the simple fact that their body weight is so variable, correctly determining the dosage and concentration for any medication is absolutely vital, and clinicians only have ONE opportunity to get it right or tragedies can occur—as in Emily Jerry’s case. Dr. Anne Lyren, Clinical Director of the SPS National Children’s Network, was the ideal moderator of this year’s panel discussion. Dr. Lyren played a vital role in establishing SPS’s Quality & Safety Program. At the beginning of this video, listen to Dr. Lyren’s opening remarks emphasizing how she truly feels about Emily’s legacy, and what we can all learn from what happened. It’s extremely powerful! Here is a screen capture of the event during the panel discussion as we all discussed our roles in reducing medical errors and dramatically increasing patient safety. Absolutely awesome day today speaking at St. Barnabas Hospital in NYC, where the clinician caregivers are all laser focused on patient and medication safety! St. Barnabas is a stellar example of a smaller hospital, with often limited resources, that has successfully created a true “culture of safety” at their medical facility with all of their incredible clinician caregivers. This type of culture ensures that every single one of their patients receiving healthcare have not only the best possible outcome during their course of treatment, it also significantly lowers the probability of tragic preventable medical errors from occurring.